Someone messaged me to ask about how to wear dark berry/plum/purple-toned lipsticks, specifically NYX Very Berry and NYX Eggplant. NYX Eggplant is quite an odd and unique shade (pearlescent deep purple with grey tones), so I'll break this post into 3 parts. Starting from the top, and running clock-wise. A pale duochrome ivory-gold: This looks beautiful contrasted with a dark lip. It brigtens up your eye area without overpowering or taking attention away from the lip. Options: MAC Vanilla pigment (not shadow), Lime CrimeNymph, The Body Shop Eye Shimmer #02 Gold. Rich copper sparkle: I don't like wearing bright coppers usually because I feel it makes my eyes look swollen, but this is the one product that I DO like. MAC Copper Sparkle pigment is not really an eyeshadow pigment. It comes in tiny flecks like crushed metal foil, so you need to use a base and clean off any fallouts, but once it's on, it's gorgeous. Soft Silver/Ash: A touch more dramatic than a pale yellow gold, because silver contrasts more with the deep prune-brown. Good if you want a more noticeable look, but don't want to go overboard with the eyes. 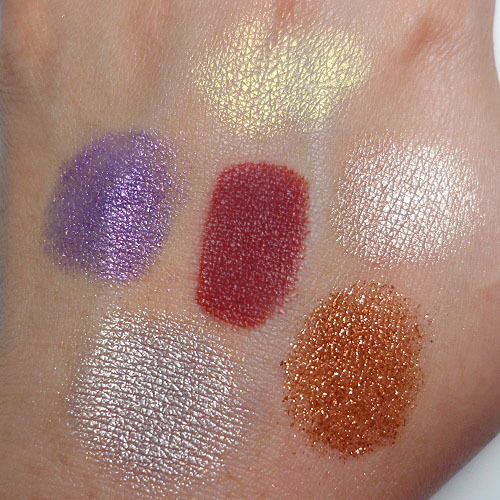 MAC Cyber from the Metal X Collection is a true silver, while Palladium (swatched here) will look good if silver is too stark on you and you want more warmth.